MS is a neurological condition which affects around 100,000 people in the UK. 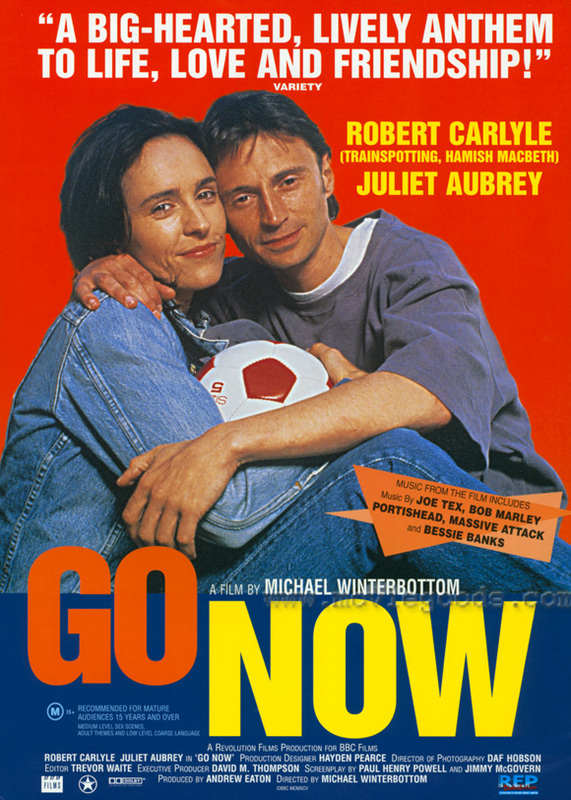 Highlighting the impact multiple sclerosis has on a young sportsman and his loved ones, Go Now is a heart wrenching, intense and unforgettable film from 1995, and it comes to DVD 20 years after it was originally broadcast by the BBC, courtesy of Simply Media. Starring an outstanding cast with Robert Carlyle (Trainspotting) in the lead role, directed by BAFTA winner Michael Winterbottom' (The- Trip) and written by the multi award winning Jimmy' McGovern (The- Street) and Paul Henry Powell (The Vice). The BAFTA winning film arrives on DVD 12 September 2016, accompanied by an exclusive special feature with footballer Danny' Wallace talking about his own experiences suffering with MS. Simply Media is collaborating with The'MS'Society'UK and will be donating £1 per DVD sold to the charity. Construction worker and keen amateur footballer Nick Cameron (Carlyle) has the best of everything when he meets and moves in with soulmate Karen (Juliet' Aubrey' –- The- Constant- Gardener). But complications arise when symptoms of a mysterious illness including numbness and double vision begin to sap his energy. As MS sets in, his physical powers quickly diminish and he loses his job, his sport and his sexual drive. Eroded by frustration, anger and self pity, Nick lashes out at Karen, even accusing her of sleeping with her boss. At his lowest ebb, summoning vestiges of pride and self sacrifice, Nick urges Karen to leave him. Will she accept an easy escape from his despondency and rancour, or stand by this frail shell of the man she fell in love with? The electrifying central performances are supported by engaging early screen appearances from James Nesbitt (Cold-Feet) and Sophie Okonedo (Undercover). Blending raw emotion with laddish dark humour, Go Now was originally broadcast on the BBC in 1995 and won a BAFTA for Best Editing and writers Jimmy McGovern and Paul Henry Powell – who drew on his own experiences battling MS – shared the Royal Television Society’s Best Writer award. Cast your mind back to the early 1990s! How did the TV drama Go Now come about? The film that was to become "Go Now" began its journey in a writing workshop run by Jimmy McGovern. He and Paul Henry-Powell worked together with people who had multiple sclerosis , and the film was written based on the life experiences of those people. When did you come on board the project? And why did you want to make this film? I came onboard quite early on. I was approached through my agent, and told they were finishing a script, which was essentially a love story between two characters Karen and Nick. I knew of Jimmy McGovern , and had followed his work for years. I had also just recently seen Michael Winterbottom's debut film Butterfly Kiss: a film about a female serial killer and her girlfriend travelling through the north of England, which I had really rated. So when the offer came through I was excited by the idea and keen to meet them for a chat about the role. I had around this time been offered the part of Guinevere in First Knight, playing opposite Richard Gere, and Sean Connery. I had some big queries about the script, and found the objectification of the central female character demeaning. To my agent's shock/horror I turned the project down in favour of the independent film Go Now. In contrast to the big Hollywood blockbuster, there seemed to me a real point to making this film; that it was a story that should be told; a story that I wanted to part of. It was important to me that the script was written by and going to be directed and produced by people with integrity and empathy. Michael Winterbottom (director), Andrew Eaton ( producer)and Jimmy McGovern and Paul Henry-Powell ( writers) had both of these in spades. It was a very cool team. I wanted to be a part of that team, and a part of bringing that story to life. I came back with a definite yes. What was it about Karen’s role that drew you in? The role of carer is a hard one, but as carer you also have to survive yourself. You need to care for your loved one, not be over cloying or over protective, to continue to treat the one you are caring for as "normally" as possible, to continue to live your own life and meet your own needs too, and this is hard to do. It's a difficult balance. You have to be so strong emotionally and physically, and the question Karen asks herself is: Do I love him, or do I pity him..and where do those feelings cross collide and intermingle? Do I love him, like him enough even, to put my life on hold when he needs 24/7 care. If attraction fades will the love be enough. It was a big challenge to get my head around all of that. It's not uncommon I know, but it is unusual to be so young and have to give so much. And yet millions of people in the U.K and all over the world are doing just that: caring for a loved one who is battling with a disabling painful disease. The film is so celebratory though: it's young, it's cool, it's full of love and humour, as well as tears and pain. It’s full of fantastic music/soundtracks, and it is truly funny at times. Did MS mean much to you at the time? Did you know anyone with the condition? A good friend of my mum's had M.S, so I was aware yes, but I had a lot to learn. I went to a local multiple sclerosis talking group to meet people suffering from it to try and understand more about the condition. Robert Carlyle and I met up also with a married couple in Bristol. He had M.S and she was his carer. She was amazing in helping me understand about Karen's role in caring for Nick. We spent many days together, and it was very helpful. What was the impact of Go Now on your own career? That’s hard to say. More importantly for me was that I had an opportunity to work with some amazing people. Michael Winterbottom was quite revolutionary at that time. I had recently finished filming Middlemarch, a period piece, prior to Go Now. There are inevitably certain restrictions in the style of filming those pieces, and to work with Michael was just so liberating by comparison. I can’t tell you! It was just so great to be able to physically be exactly how you felt you needed to be in in that particular scene at that particular time. Michael shot it in such a way that the camera was capturing our characters in their action,the camera came to us... it didn't matter whether words were missed on camera, often shot in round arcs, and there was not a single "mark" ( coloured strips of tape on the floor for actors and camera team to know where you're going to stand/sit/be) in sight. Daf Hobson the director of photography/cameraman and his focus puller were the most talented people ever, and as actors we were free to just do our thing without restraint, something that was very spoiling, and for years after on other projects I would yearn back to that time. Did you keep in touch with any of your co-stars and/or the production team? Actually yes the four of us – myself, Robert Carlyle, Sophie Okonedo, and Jimmy Nesbitt – all kept in touch for a while. We were away from home filming in Bristol together for the whole shoot and we became quickly very close as you do. But then, as actors, we go on to the next project, and join another new "family". We are transient by nature. I did make another film with Michael Winterbottom: Welcome to Sarajevo, also shot by Daf Hobson. It's a film based on the true story of British reporter Michael Nicholson who brought an orphan from Sarajevo to Britain. Its authentic, real, naturalistic, intercutting actual news footage from the siege of Sarajevo. It was a story close to my heart: two years previously I had joined Haris Pasovic's Sarajevo International Theatre Company, working in Amsterdam, and I had made strong friendships with the company who had fled the war there. I often work with the same director again and again. You have an immediate shortcut to how you work together and an innate trust already inbuilt. Jimmy McGovern wrote the script and Michael Winterbottom directed the film, both highly respected in their fields. What did they bring to the project? Well Jimmy obviously brings a harsh authenticity to everything he touches. He’s incredibly talented. But I need to mention Paul Henry-Powell who co-wrote it, who was equally exacting , full of integrity, and had a great way of unleashing the humour of the situation too.